Discussion in 'The Dallas Art Gallery' started by southfork88, Oct 15, 2016. So do I. I cannot think of another couple (in today's television landscape) that matches these two for chemistry and I'll probably never see it again in my lifetime. 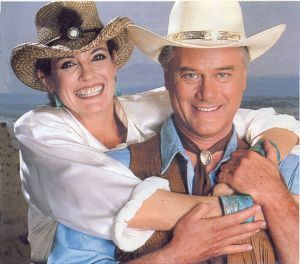 Whether they were married, separated or divorced, everytime JR and Sue Ellen shared a scene sparks jumped from the small screen. Pure magic. I miss ... Ellie & Clayton in bed ! Okay, I'm intrigued. Was this portrait at the Southern Cross? 99% sure that's Laurel Ellis before we meet her character. Clayton keeps returning to the gallery to look at the portrait. Another great character to enhance the Ewing story. This is what made Lorimar Dallas so good as opposed to TNT Dallas. On Lorimar Dallas secondary characters were just as important but were never allowed to hog the screen more than necessary. On TNT Dallas the secondary characters overshot the Ewing family in importance and outstayed their welcome. Where the hell was Jock when we needed him? I'll go you one further, Rove. I think many of the supporting players on the original Dallas were as entertaining as the main cast. I always looked forward to seeing Harv Smithfield, along with Punk and Mavis Anderson. many of the supporting players on the original Dallas were as entertaining as the main cast. I have mentioned this somewhere else but when viewing Lorimar Dallas you'll notice a Ewing or Barnes was always in every scene. It's clever for the writers to create this because it keeps the focus of the story exactly where it needs to be...the Ewing family. Nothing else really mattered. Secondary characters come and go but this series was about the Ewing family. The main issue I had with TNT Dallas was often we had to tolerate long winded scenes with no Ewing's or Barnes. While the story itself centered around the Ewing family I was sometimes screaming at the computer asking, "Where the hell are the Ewing's? Even Esther Shapiro was viewing TNT Dallas because she questioned, "Where is Larry?"